Hey Gang, you might notice a little slow down in the blog posts here, but I’m going to try and do at least one Halloween Scene per day moving forward through October. I’ve got something in the works that you’ll know about soon enough. Maybe by the end of the week. I am ridiculously embarrasses to admit that I have never seen Carrie all the way through, unrated up until this point. I swear, I THOUGHT I had. 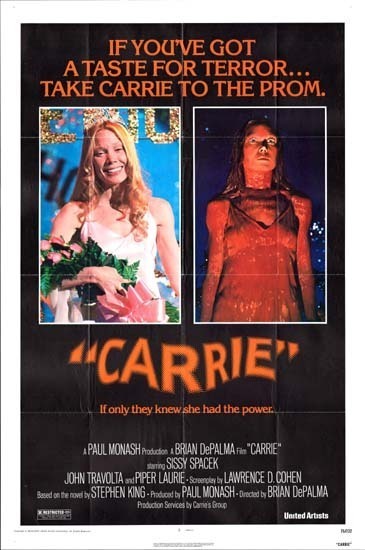 It was even crossed off in my copy of Creature Features, but, after deciding to watching something classic on the NetBox and choosing Carrie, I quickly realized I had never seen this movie. You know how I knew I’d never seen it? The tampon scene. I’ve heard about it and remembered hearing about a little too late and was completely horrified. Not by the menstruation itself, but by how utterly horrible that would be if it happened to you in public and, instead of people being like “Oh hey, we all do that and don’t die, no worries” they laugh and throw tampons. Even the fat, ugly girl with glasses. What does she have to laugh at!!! Sorry, I got heated up watching this flick (is that a pun?). I had three overwhelming emotions the whole time: dread, anger and hope. See, we all know about the pig’s blood at the prom and that carnage quickly ensues. But I was still gritting my teeth the entire time Carrie was getting ready for the Greatest American Hero to take her to prom. I kept wondering if he and his maybe girlfriend (the survivor) were in on it, or if they really were just being nice. I wanted him to be a nice guy because he really seemed like one, unlike that pig-killing mook Travolta. Anyway, once the craziness actually started (and boy, does director Brian De Palma play these scenes up to all their nerve-wracking potential) that’s when the rage kicks in. It’s weird because I don’t usually get this emotional when watching a movie, but the dread I felt reminded me of the first time I saw Dark Knight. I had a visceral, in-my-gut reaction to Heath Ledger’s Joker. I was scared of the screen whenever he was on. I had the same feeling leading up to the prom scene. That’s a hell of a thing to get a jaded film fan like me to feel. Think about it. The dumb villain girl was SO angry at someone else for HER OWN MISTAKE that she set into motion a fairly complicated plan with a lot of working parts that went off without a hitch, all for the sole purpose of humiliating the initial victim of her jerkiness AGAIN. If she had survived, the CIA should have picked her up to plan assassinations, cause she’s cold blooded. Also, wow, I did not see the teacher’s death coming. That was nutzocrazytown. Bisected even. You gotta reign that in Carrie, at least to have one witness who can blame the dumb girl with the red hat for everything even though she’s dead (sup PJ Soles). This far into the review, I’m sure it will come as no surprise that I’ve never read Stephen King’s novel that this was based on, so I have no idea how much of the movie was in the book and vice versa or how “accurate” it was, but it works perfectly on the screen. One of the most impressive story elements is the layers of danger. You’ve obviously got Carrie with her crazy power and the evilness of teenage girls, but also Carrie’s mom. You NEVER know what she’s gonna do. Damn. I wonder of JK Rowling got the closet idea from Carrie. If so, she should have put a scene in the movies where Harry burns their stupid house to the ground, because you NEED that kind of catharsis after a movie like this. And, even as much as I wanted Carrie to survive this whole mess, move to another town and start over, maybe raise a child of her own who isn’t crazy, she had to pay for what she did. Finally, the final bit. Unlike the prom scene, there was zero dread for the final “hand out of the ground” scare. Part of the reason is that my memory was refreshed of the scene while watching Going To Pieces, when Sean Cunningham and Tom Savini are talking about the ending of Friday the 13th. They talk about having just seen Carrie and wanting to do something like that, hence the burnt kid out of the water. Another factor that kind of took me out of the moment comes from the survivor’s mom. She’s talking to her friend on the phone and says something along the lines of “The doctor says that she’s young and she’ll forget.” Haha, what?! She’s 17 or 18 and she’s going to forget the night her entire class was decimated by Hellfire and a house fell into the earth? The night her maybe-boyfriend died? Wow, good doctoring there. The final reason why it wasn’t very scary is that it’s very obviously a dream, She’s all glowy and whatnot, plus the hand comes out kind of slow and sloppily. I guess it would have been pretty scary the first time you saw it, but I guess I’ve seen too many movies that ripped the idea of that last minute scare like F13 and The Strangers. Are you guys psyched? It’s almost October and you know what that means? Hundreds and hundreds of horror movie reviews on blogs just like this one. After a brief sabbatical from horror, I’m back in the game myself as any regular reader might have noticed. So much so, that I’ve actually got a list on my computer with all the backed-up reviews I want to do. One such movie is Going To Pieces: The Rise And Fall Of The Slasher Film (note to NetBox users, it’s missing the “Going To Pieces” title in the beginning, but, as far as I know, it’s still on there). Holy crap, this is a great movie. I haven’t seen too many documentaries about horror, in fact, I haven’t seen too many docs on the whole, but that’s for another day. What I loved about this movie is that it doesn’t just cover the obvious like Halloween and Friday the 13th. You also get fairly long segments from the likes of Jeff Katz (a dude I got to interview before being bounced from Wizard, who was rad) and the girl who starred in Sleepaway Camp on movies like Sleepaway Camp and Slumber Party Massacre. These are the weird slasher flicks that I cut my horror teeth on back at the Family Video in Toledo and it’s cool to see other people talking about them with such gusto. You also get a look at horror luminaries like John Carpenter and Wes Craven today, which is interesting. One problem I had with the movie is that they didn’t show who each person was on a regular basis. So, seeing as how I was working on the computer part of the time and have a generally crappy memory, I had no idea who the tall man sporting sunglasses and long white hair was until the very end, and it turned out to be Carpenter. Like I said, though, I loved this movie and it is an absolute must for slasher fans. I was even jazzed to find out that movies I have only seen recently like Graduation Day, The Burning, April Fool’s Day & My Bloody Valentine. It’s also a great way to check out new movies to add to your “to see” list, though beware of spoilers. Now I gotta check out Happy Birthday To Me! Thanks Going To Pieces! I just realized that I never really talked about the Friday the 13th remake on here. Well, it was the last horror movie I saw in the theaters (the first in over a year I think) and I dug it, which was great, because I didn’t really like the Texas Chainsaw Massacre remake and hated the Halloween one. I’m long past being outraged over these kinds of remakes, I mean, you can always go back and watch your favorites again and we’ve all seen what happens when these franchises go on for too long and, if nothing else, maybe they’ll keep our favorite horror icons in the consciousness enough to get kids to check out those old movies. Anyway, with all that being said, today /Film linked to the new Nightmare On Elm Street trailer. I’m no NOES expert–I haven’t watched one of the flicks since my burgeoning days as a horror fan as it was one of the few series’ that they had all the tapes of–but it seems like they used a fair amount of material from the first flick. I’m looking forward to a mix of both old and new, but hopefully not so much new that I already know all the beats. What I don’t want is too much back story on Freddy, which is what the trailer starts off with. That’s where the Halloween remake went wrong, so hopefully that’s not where we’re going this time around, but we shall see. Plus, getting Jackie Earle Haley to play Freddy was a stroke of genius, so that’s at least some early points in the positive column. This trailer adds a few more, in my opinion. I have absolutely no memory of this game, but it looks crazy awesome. And gross. Which makes it more awesome. 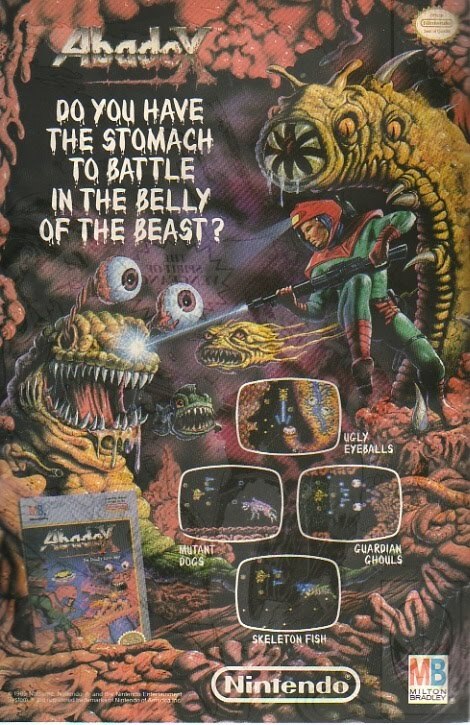 In case you can’t read the text around the small boxes towards the bottom they read “Ugly Eyeballs” “Guardian Ghouls” “Skeleton Fish” and “Mutant Dogs.” Why isn’t this bad boy getting the remake treatment?